If the nominations in our European awards prove anything it is that dsc’s contributors have a wide variety of opinions. This is another section notable for the sheer number of nominations and for the fact that the winner here was the only team to attract more than a single vote! Success in domestic championships in Spain and Belgium is recognized with nominations for Playteam SRL and Selleslagh Racing Team. A season long attack on the FIA GT Championship laurels is recognized too with both Vitaphone and Larbre Competition also nominated. 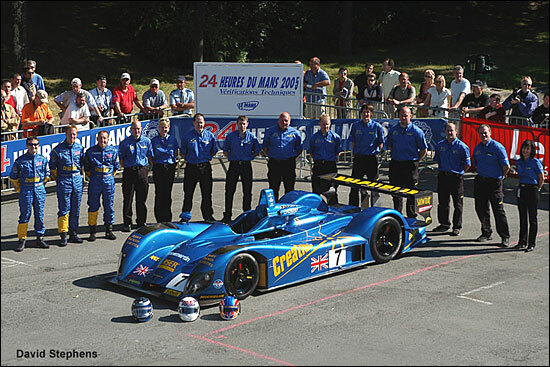 Among the prototype ranks, RML is recognized for its gutsy Le Mans win in LMP2. Zytek Engineering is recognized too for the double win in the LMES. Martin Short’s Rollcentre Racing gets an honourable mention: a two car Dallara effort, coupled with the return to top class prototype racing of Nissan and a consistent season’s running left them in contention until the very last race. Henri Pescarolo’s team gets a vote here too with the LMES title a perhaps fitting result for the investment placed in hybridizing the ageing C60s. The winner by a whisker though is a true privateer team which took calculated risks in the off season, and invested in a new package for 2005 with changes to their tyre and engine suppliers. Their pace was right on the button but their luck was appalling – even now as the 2006 season approaches it is barely credible that this team didn’t finish on the top step of the podium in 2005.
dailysportscar.com’s 2005 European Team of the Year is Creation Autosportif. “This team is what sportscar racing is all about – doing something different to the rest, testing hard, racing hard and enjoying talking about it before during and after the event.” – Graham Goodwin.